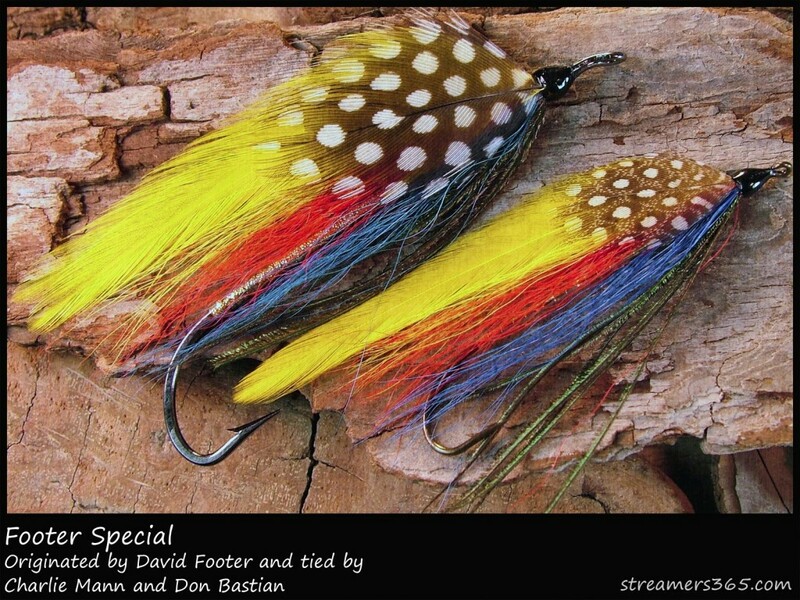 Footer Specials – tied by Charlie Mann – top, and Don Bastian – bottom. Darren MacEachern photo. The link to Streamers365.com above also presents a bit of the history on the pattern. Ed agreed. His only request of me was to present a pattern that Bean’s would have the materials for tying in their stock. 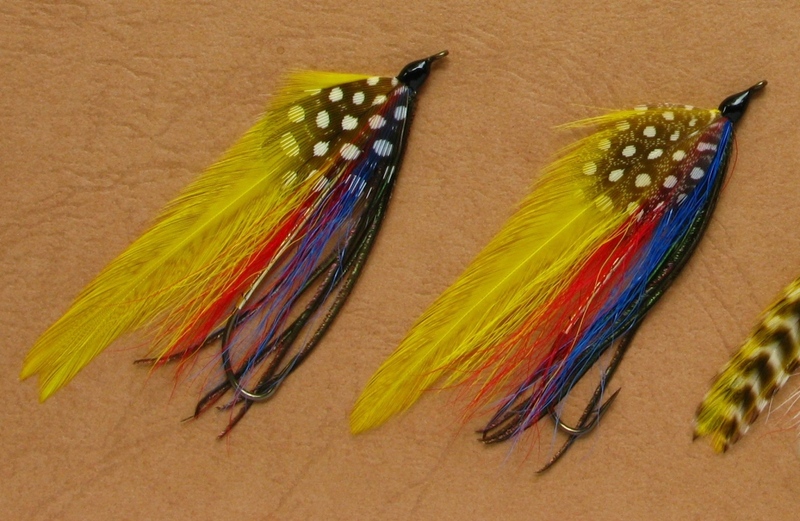 The Footer Special met these requirements, also it is a Maine streamer pattern, and was one of the streamers featured in my streamer DVD, Traditional Streamers and Bucktails. Little did I know that 2012 is the 50th Anniversary year of the creation of the Footer Special. The resulting Friday evening class turned out to be the best class Bean’s ever had in terms of the number of people present. Nick Sibilia, member of the Saco River Salmon Club in Biddeford, Maine, http://www.sacosalmon.com/ is a friend of David Footer and had informed David that I was tying his pattern at the class. While there were about 17 students, eight or ten members of the Footer family was present, including daughter Julie who has been David’s right-hand girl for many years in his taxidermy and art studio. David Footer came by my display table at Bean’s on Saturday and I got to spend some time talking to him, and I also met his wife. On Sunday we had lunch together in the room provided by Bean’s for the Spring Fishing Expo guests and celebrities. It’s been a delight getting to know David; he is a very friendly, kind man. And talented. He trained under famous Maine taxidermist / artist Herbert Welch, originator of the famous Black Ghost streamer. Including the Footer family members and additional spectators, there were about thirty-five people present at the class. Needless to say, Bean’s staff of retail and promotional employees were delighted by this unanticipated response. 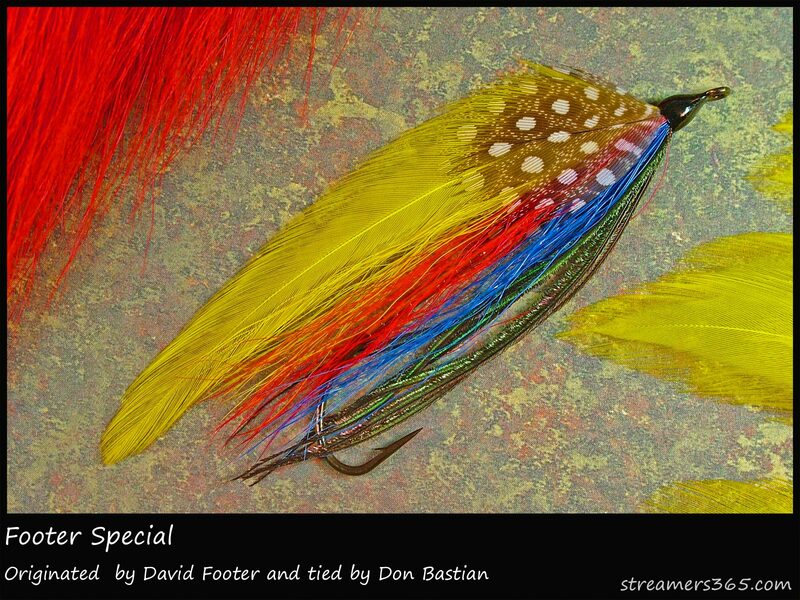 David’s creation of the Footer Special mirrors the fly designs of Maine Warden Supervisor, Joe Stickney, originator of the Supervisor – also one of my other patterns presented on Streamers 365.com: http://streamers365.com/2012/01/20-supervisor/ and other streamer patterns including the famous Warden’s Worry and Lady Doctor. 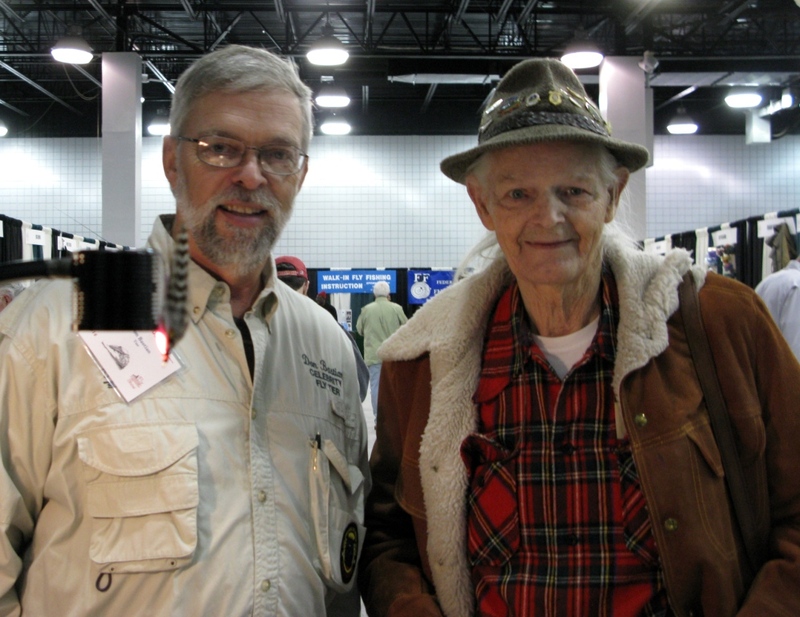 Joe Stickney and David Footer share the common creativity of fly pattern design, while neither of them tied flies. They created their patterns and had them dressed by friends who were fly tiers. I tied two Footer Special streamers the night of the class, and presented them to David on Sunday at the L. L. Bean Spring Fishing Expo. I intend to write more on some of the details and post photos of those flies as well. Thanks for reading! I have seen and recognized Mr. Footer at various shows for years but I never had the privilege of meeting him until last weekend. It was a pleasure to meet him. Below is a photo of David and me taken at the show. The creation of the Footer Special occurred similarly to the origin of the Supervisor, Lady Doctor, and Warden’s Worry, created by Maine Warden Joseph Stickney, who was also not a fly tier, but envisioned his patterns and had them dressed for him by fly tiers who were his friends. Don Bastian and David Footer. Note the streamer fly hanging on my McKenzie Bright Light; the pattern is a Carrie Stevens Pink Lady; the head cement is drying. David has been a licensed taxidermist since 1946 and is recognized for his fish mounts and old fish mount restorations as one of the best in his field.